Conducted by the British-Italian conductor and pianist Sir Antonio “Tony” Pappano, Orchestra and Chorus of Accademia Nazionale di Santa Cecilia, Roma perform selected works of the famous Italian composer of operas, Giuseppe Verdi (9 or 10 October 1813 – 27 January 1901). Recorded at the Royal Albert Hall, London on July 20, 2013 (during the BBC Proms). Soloist: Maria Agresta, the Italian soprano. Portrait of Giuseppe Verdi by Giovanni Boldini, 1886. Verdi (9 or 10 October 1813 – 27 January 1901) was an Italian composer of operas. In his early operas Verdi demonstrated a sympathy with the Risorgimento movement which sought the unification of Italy. He also participated briefly as an elected politician. The chorus “Va, pensiero” from his early opera Nabucco (1842), and similar choruses in later operas, were much in the spirit of the unification movement, and the composer himself became esteemed as a representative of these ideals. An intensely private person, Verdi however did not seek to ingratiate himself with popular movements and as he became professionally successful was able to reduce his operatic workload and sought to establish himself as a landowner in his native region. He surprised the musical world by returning, after his success with the opera Aida (1871), with three late masterpieces: his Requiem (1874), and the operas Otello (1887) and Falstaff (1893). His operas remain extremely popular, especially the three peaks of his ‘middle period’: Rigoletto, Il trovatore and La traviata, and the bicentenary of his birth in 2013 was widely celebrated in broadcasts and performances. A winner of several music competitions, she made her debut in 2007 and since 2008 she has appeared in several productions in Spoleto, Messina, Opera national de Lorraine, Sferisterio Opera Festival in Macerata, Festival dei Due Mondi di Spoleto, Carnegie Hall of New York, Union League of Philadelphia, Festival Barokkimusiikkia of Helsinki, Doha National Philarmonic (Qatar), Hermitage Theatre of St. Petersburg, Enescu Hall of Bucarest, Sibiu Philarmonic Hall (Romania), Baku Philarmonic Hall (Azerbaijan), Incheon Opera festival (South Korea). Her success came in 2011, when she performed I Vespri Siciliani at Teatro Regio in Turin conducted by Gianandrea Noseda, with great reviews from public and critics. Since then, she has been invited to sing on the most important stages worldwide. Highlights include Norma in Tel Aviv, La Bohème at Arena di Verona and in Munich, Gemma di Vergy at Teatro Donizetti in Bergamo, Il Trovatore in Salerno, Don Giovanni at La Scala, where her performance was highly praised. 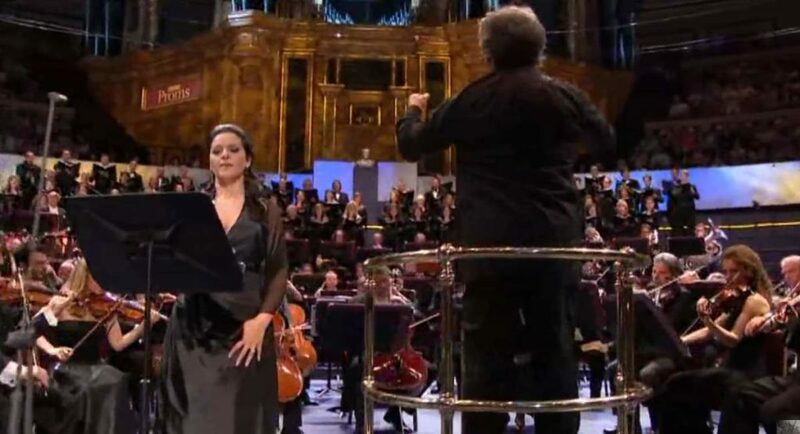 She sang La bohème in Turin and La traviata in Salerno, where she obtained a big personal success, and she debuted at Palau de les Arts in Valencia with a new production of Il Trovatore conducted by Zubin Mehta, with great reviews from public and critics. Moste recently, she sang Don Giovanni at Arena di Verona. She also opened the 2012-13 season of the Teatro dell’Opera di Roma conducted by Maestro Riccardo Muti in Simon Boccanegra by G. Verdi. Of note also the interpretations of Joan of Arc at the Musikverein of Graz, La Bohème and Oberto Conte di San Bonifacio (new production) at the Teatro alla Scala, Rogues and La Bohème at the Teatro La Fenice in Venice, The Vestal in Dresden, and in next commitments La Bohème Opera Bastille in Paris, Il Trovatore (new production) to Vienna Festival, The Two Foscari at the Royal Opera House in London, I Due Foscari in Vienna, Simon Boccanegra in Frankfurt, I Puritani Opera Bastille. Orchestra and Chorus of Accademia Nazionale di Santa Cecilia at the BBC Proms 2013. The Orchestra dell’Accademia Nazionale di Santa Cecilia was the first orchestra in Italy to devote itself exclusively to the symphonic repertoire, giving premieres of major masterpieces of the 1900, such as Respighi’s Fountains of Rome and Pines of Rome. Founded in 1908, the Orchestra has been conducted by some of the major musical figures of the 20th century: from Mahler, Debussy, Saint-Saëns, Strauss, Stravinsky, Sibelius, Hindemith, Toscanini, Furtwängler, De Sabata, Karajan and Abbado to the most impressive performers of our day including Muti, Gergiev and Thielemann while Bernardino Molinari, Franco Ferrara, Fernando Previtali, Igor Markevitch, Thomas Schippers, Giuseppe Sinopoli, Daniele Gatti, and Myung-Whun Chung have been its Music Directors. Leonard Bernstein was Honorary President from 1983 to 1990. With Sir Antonio Pappano in the role ofMusic Director since 2005, the stature of the Orchestra has enjoyed extraordinary success, building an international reputation for itself. With Pappano at the helm, the Orchestra has appeared at some of the major music festivals including the Proms in London, White Nights in St. Petersburg, Lucerne Festival, Salzburg Festival and has performed in some of the most world’s best-known venues, including the Philharmonie in Berlin, Musikverein in Vienna, Concertgebouw in Amsterdam, Royal Albert Hall in London, Salle Pleyel in Paris, La Scala in Milan, Suntory Hall in Tokyo, Semperoper in Dresden and Konzerthaus in Vienna. After long-term collaboration with some of the biggest international record labels who have produced recordings that have since become legendary, Santa Cecilia Orchestra records extensively for Warner Classic. The releases, under Pappano, include Puccini’s Madama Butterfly (with Angela Gheorghiu; the recording won a Brit Award), Verdi’s Requiem (Gramophone Award, BBC Music Magazine, Brit Classical), Rossini’s and Pergolesi’s Stabat Mater with Anna Netrebko (Gramophone Editors’ Choice Award), Rossini’s William Tell, Mahler’s Symphony no.6, Rossini’s Petite Messe Solennelle, Verdi’s Quattro pezzi sacri, Britten’s War Requiem, and a CD entitled Rossini Overtures. Recently recorded, Verdi’s Aida boasts a stellar cast (Anja Harteros, Jonas Kaufmann, Erwin Schrott) and has taken home numerous awards: Best Recording 2015 for The New York Times and for The Telegraph, Best opera 2015 – Apple Music, Choc Classica de l’année, Diapason D’or and Choix de France Musique, Record of the month for Gramophone. A CD also came out in 2015, with Tchaikovsky’s Piano Concerto no. 1 and Prokofiev’s Piano Concerto no. 2 performed by Beatrice Rana, and, for Decca, Brahms’s Violin Concerto with Janine Jansen. Antonio Pappano and the Orchestra also recorded Nessun Dorma, The Puccini Album with tenor Jonas Kaufmann (Best Classical Music Recordings of 2015 for The New York Times), which made the world charts. The origins of the multi-secular Accademia Nazionale di Santa Cecilia are closely linked to choral singing: in the second half of the 1500’s, several Chapel-masters and Choristers formed an association, electing as President Giovanni Pierluigi da Palestrina, thus founding the Accademia. In May 1595, Pope Sisto V issued the papal bull Ratione congruit, the act officially founding the Congregazione dei Musici. The objectives of the Institution, which was launched as an association having both artistic and charitable aims, have undergone continuous modification over the centuries, but the promotion and growth of the art of music in all its manifestations have always been the inspiration guiding all its activities. The Chorus of the Accademia Nazionale di Santa Cecilia, made up of about 90 members, appears in both the winter and summer seasons of the Accademia, joining the Orchestra for performances of the great classic and modern symphonic-choral works. Highlights among its more recent engagements include tours the Santa Cecilia ensembles made together with Music Director Antonio Pappano to the Dresden Semperoper (2006), the London Proms (2007, 2011, 2013) and to the Salzburger Festpiele (2011, 2013, 2014); its appearance in Lucerne with the famed Lucerne Festival Orchestra directed by Claudio Abbado (2006); and its participation (October, 2007) in the Sacred Music Festival in Rome, for the performance of Verdi’s Requiem with the Vienna Philharmonic conducted by Daniele Gatti. The Chorus has also made numerous recordings. Together with the Accademia Orchestra, it took part in the recording of Madama Butterfly by Puccini, the Requiem by Verdi (both directed by Antonio Pappano), which received the 2010 BBC Music Magazine Award as best recording (choral section), the 2010 Classical Brits Critics Award and a Gramophone Award. Among the other recordings are the Stabat Mater by Rossini, Verismo Arias with Jonas Kaufmann (Decca), the opera William Tell and the Petite Messe Solennelle by Rossini (EMI), Verdi’s Quattro pezzi sacri and Britten’s War Requiem (Warner Classics). Puccini’s Madama Butterfly (with Angela Gheorghiu; the recording won a Brit Award), Verdi’s Requiem (Gramophone Award, BBC Music Magazine, Brit Classical), Rossini’s and Pergolesi’s Stabat Mater with Anna Netrebko (Gramophone Editors’ Choice Award), Rossini’s William Tell, Rossini’s Petite Messe Solennelle, Verdi’s Quattro pezzi sacri, Britten’s War Requiem. Recently recorded, Verdi’s Aida boasts a stellar cast (Anja Harteros, Jonas Kaufmann, Erwin Schrott) and has taken home numerous awards: Best Recording 2015 for The New York Times and for The Telegraph, Best opera 2015 – Apple Music, Choc Classica de l’année, Diapason D’or and Choix de France Musique, Record of the month for Gramophone. Antonio Pappano, the Orchestra and the Chorus also recorded Nessun Dorma, The Puccini Album with tenor Jonas Kaufmann (Best Classical Music Recordings of 2015 for The New York Times), which made the world charts. Ciro Visco has been the Chorus Master at the Accademia Nazionale di Santa Cecilia since March 2010. Giuseppe Verdi’s String Quartet in E minor was written in the spring of 1873 during a production of Aida in Naples. It is the only surviving chamber music work in Verdi’s catalogue. Tremens factus sum ego et timeo, dum discussio venerit atque ventura irae, quando coeli movendi sunt et terra. Dies irae, dies illa calamitatis et miseriae; dies magna et amara valde. I tremble, and I fear the judgment and the wrath to come, when the heavens and the earth shall be moved. The day of wrath, that day of calamity and misery; a great and bitter day, indeed. Grant them eternal rest, O Lord, and may perpetual light shine upon them. Deliver me, Lord, from eternal death on that awful day. Te Deum, a setting of the Latin “Te Deum” for double chorus and orchestra composed in 1895 and 1896. They were first performed together (without the Ave Maria) in a concert by the Paris Opera on April 7, 1898.